Hypothetical question: If you had 7,688 tiny Swarovski crystals, what would you do with them? You'd glue them to a cheap Murcielago model, you say? Oh! It's like we were separated at birth! The glitzy trinket you see before you is made by Californian model company Maisto. 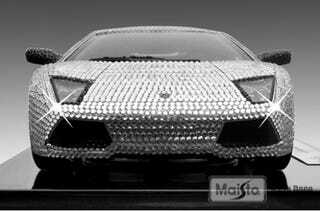 It's offically dubbed the "Lamborghini Murcielago LP640 Made With Crystallized Swarovski Elements," and it wants to be your friend. There's only one catch: The model is only available in Europe. It's limited to 550 examples, it comes with its own box and commemorative mount, and it costs the equivalent of $2500.